There is nothing specifically American about the combination of bread and cheese. In ancient Mesopotamia, harvesters and shepherds would take their flatbread and feta out into the fields with them to eat at midday. By medieval times, this had progressed to rye bread and hard cheese, but the idea was pretty much the same. John Montagu, the fourth Earl of Sandwich, had yet to be born, but it is highly likely that it occurred to at least one peasant to put the cheese between two slices of bread. Naturally, since once you taste rarebit you don’t want to live without it, Brits brought it with them to America. But by the turn of the 20th century, Americans were working very, very hard at their office jobs and had no time to indulge in anything like a rarebit at lunchtime, which takes time to prepare and also has a tendency to drip. Fortunately, the Canadians—of all people!—provided a way to satisfy the American craving for melted cheese during the workday. Their contribution to our national cuisine was called a “cheese dream.” In her book Lunch: A History, Megan Elias writes that in Canada, there were two versions of the cheese dream, one sweet and one savory. The sweet cheese dream was made with cheese-flavored shortbread and tart jelly. That didn’t really catch on south of the 49th parallel. But the savory version—a cheese sandwich on white bread, buttered on the outside and tossed on a griddle—became an American classic. A recipe from 1908 from the San Francisco Call shows that the cheese dream differs very little from the modern grilled cheese. “Cut thin slices of bread and butter on both sides. Spread on lightly a little French mustard on one side of each slice, then put two slices of bread together with a layer of cheese between coming next to the mustard. Put in oven and let remain until the cheese has thoroughly melted and the bread is crisp… If desired, cut the bread in heart shaped pieces, thereby making it a little more attractive.” Amazingly, Mrs. Jessie Smith won a $1 cash prize for coming up with this. (That’s the equivalent of about $28 today, enough for several grilled cheeses and a bag of chips, too.) Other enterprising home economists and home cooks created their own versions along the same basic theme with variations like tomatoes, bacon, and bread crumbs. Some early recipes also suggested dipping the entire sandwich in a mixture of milk and beaten eggs, like French toast. What really sealed the fate of the grilled cheese as an American classic, though, was the invention of processed cheese in 1911. In 1916, James L. Kraft devised a method of pasteurizing his factory-made cheese (produced from shredded and repasteurized refuse cheddar mixed with sodium phosphate) so it could be shipped long distances without spoiling. Thus, you could always have some Kraft cheese on hand without worrying about mold. There were two other details, though, that made Kraft American cheese especially great for cheese dreams. First, it came in squares exactly the same size as standard sandwich bread, which was just starting to come pre-sliced. Second, it had a lower melting point than cheddar, so what it lacked in flavor, it made up for in gooeyness. 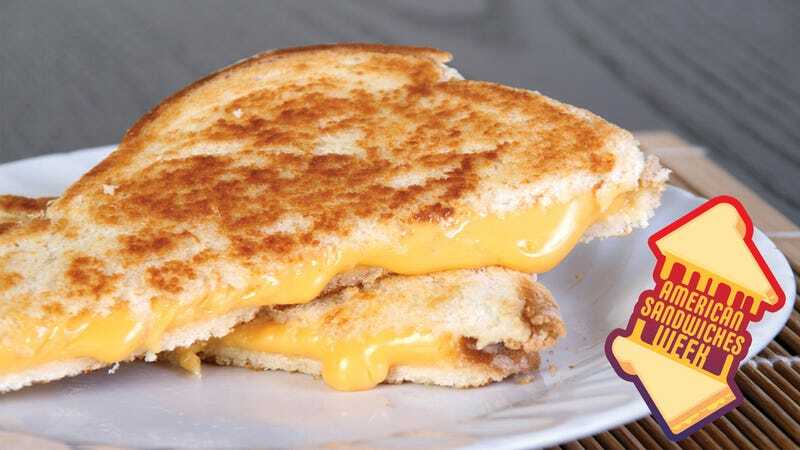 Now more than a century on, grilled cheese remains a lunchtime staple of diners, cafeterias, sandwich shops, and more upscale establishments, who try to make the grilled cheese more “grown up” by using European cheeses or by adding all sorts of embellishments, like chicken or steak or mozzarella sticks or mac-and-cheese bites or jalapeño poppers. Every few years, someone comes up with a new innovation, like grilling both sides of the bread, spreading the exterior with mayonnaise instead of butter for extra crunch, or covering the outside in toasted bits of cheese (also known as frico). All of these newfangled methods produce tasty and satisfying grilled cheeses, but the truth is, the best grilled cheese will always be the plain unembellished white bread and Kraft American cheese grilled cheese your parents made for you when you were little, either for lunch or early dinner, served on a plastic children’s plate with a small cup of chocolate milk. Or the one they may still make for you when you come home to visit. No one has to cut it into the shape of a heart for you to recognize its message: Here is unconditional love and comfort in sandwich form.